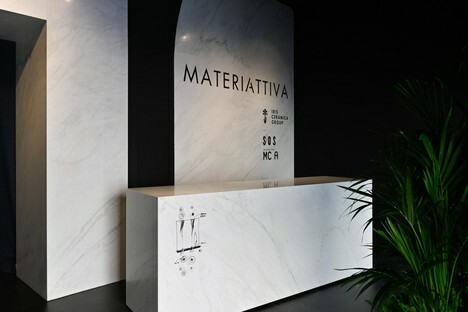 During Milano Design Week 2019, the Iris Ceramica Group in partnership with SOS - School of Sustainability and Mario Cucinella Architects presents MateriAttiva, a multisensory installation to encourage a new pact of solidarity between humans and nature. A Conversation on Sustainability is the title of the event that will take place on 11th April, with Federica Minozzi, CEO of the Iris Ceramica Group, and architect Mario Cucinella. In the heart of Brera (on the corner of via Balzan - via San Marco) until 14th April, you can visit MateriAttiva, the multisensory installation that the Iris Ceramica Group presents in partnership with SOS - School of Sustainability and Mario Cucinella Architects. To complete the installation, at 7 pm on 11th April Federica Minozzi, CEO of the Iris Ceramica Group, and architect Mario Cucinella will take part in an important narrative event: a conversation on sustainability linked to MateriAttiva. On 8th April, in a press event introduced by Stefano Luconi - Corporate Communication Officer of the Iris Ceramica Group, Claudia Letizia Bianchi, professor of industrial chemistry at the UniMi University of Milan and Mario Cucinella, architect, founder and president of SOS - School of Sustainability, presented the concept of MateriAttiva to the public. It was an interesting event in which important themes and reflections for the future emerged, together with information on the new results achieved with ACTIVE CLEAN AIR & ANTIBACTERIAL CERAMIC™ technology developed by the Iris Ceramica Group. MateriAttiva evokes the theme of a cave, a place of primordial purity to return to for a new pact between humans and nature. Immersed in a dark, secluded environment, we discover ceramic stalactites and little lighting effects, punctuated by drops that fall onto a thin veil of water on the sides of the individual pathway. At the end of the path is a larger space where a large tree emerges from a gigantic ceramic block, a symbol of life in harmony with nature and the need for a material that actively improves the quality of the environment in the space where it is used. The installation created for Milano Design Week is the evolution of a project by the Iris Ceramica Group, SOS - School of Sustainability and Mario Cucinella Architects: “a partnership based on shared values and a common desire to promote awareness of crucial issues regarding the future of the planet and the human race among the younger generations, ” as Federica Minozzi, CEO of the holding, underlines. The partnership began in 2018, with the technical sponsorship of the Italian Pavilion at the 16th International Architecture Exhibition at Biennale di Venezia. A second event, which was also important from a historic point of view for the group, was at CERSAIE 2018, with the temporary installation Pollution 2018 – RefleAction, in Piazza Santo Stefano in Bologna. Almost fifty years after “Pollution, for a new aesthetic of pollution”, the installation created in 1972, as an act of social protest, concrete action on the theme of sustainability in products was taken, with the development of Active technology, as well as in production processes with the achievement of zero emissions. It is a synergy that also creates actions to promote and spread its values; for example, with the launch of the international contest Pollution 2019: Architecture for a Sustainable Future, in which young architects and designers are invited to explore projects and new visions for sustainable contemporary living. MateriAttiva, which encourages a new pact of solidarity between humans and nature, is another aspect of this vision. It is an ethical choice of materials due to the awareness that we live in a deeply polluted environment, even inside our homes. This is why we need products that combine aesthetic qualities with an active response, a fundamental step underlined by architect Mario Cucinella: the demand for materials that are no longer “inert” but that offer an “active” answer to improving our wellbeing. Professor Bianchi also stressed that thanks to research carried out, the photocatalytic technology developed by the Iris Ceramica Group, based on micrometric titanium dioxide, is the only one to offer an active product, including under LED lighting, that contributes to improving the quality of the air and the life of humankind.